CHIME, Margaret Jenkins Dance Lab, 301 Eighth St.
“Jumpstart!,” ODC Theater, 3153 17th St. The Giants baseball team was out of town at the playoffs in Philadelphia. The rain blessed the Bay Area for the first time this fall. Football raged somewhere, but a Dance Marathon was on! Over a dozen events took place on both sides of the bay from Oct. 15-17, 2010, and many more are scheduled. If San Francisco is considered second to New York, it’s time to start keeping score. Margaret Jenkins Dance Lab is the site where choreographers work with mentors, master choreographers and Bay Area mentees. For this occasion, David Gordon, a New York artist whose work is known internationally, directed choreographers Katie Faulkner, Stephen Pelton and Deborah Slater over several weeks of sessions, offering tasks, suggestions and limits to possible directions their choreography might take. Margaret Jenkins’ dance company members participated as well as guest artists Christy Funsch and Kerry Mehling. During the two-hour session, guest were able to view the results. Use of time (limited), space (primarily the wall and floor) and sound/music yielded a variety of fascinating phrases, all of which will be developed further by the talents of Faulkner, Pelton and Slater in programs yet to be seen. ODC opened its newly renovated theater on Oct. 16 for a day of free performances including Youth Performance Showcase, ODC School Show, Theater Performance Showcases (world Dance, ballet, dance theater, contemporary dance) and videodance films. I was able to see the Lahydi Dance Theater-The Guinea Review “Yankadi Full Moon,” a lively dance with drumming executed by Alseny Soumah and M’Mah Toure dancers and Yankadi Makru drummers. The audience clapped with the rhythms that bounced from the performers. This was followed by the Academy of Hawainan Arts, “Songs for Kamehameha the Great.” Both the music and choreographry were by Kumu Hula Mark Keali’I Ho’omalu, who presented both men and women dancing the traditional form The World Dance program was co-curated by Lily Kaharrazi and Rob Ballis. Greta Schonberg, KT Nelson, Charlotte Shoemaker and Ian Winters came together to produce videodance films by local, national and international artists. The field for this work is growing fast and more film festivals are forthcoming. Congratulations ODC (Brenda Way, KT Nelson, Kimi Okada and Rob Ballis) for gifts ODC has brought to the community. Wan-Chao Chang, an “ethnic-contemporary” choreographer well-known for work with the Ethnic Dance Festival, was joined by the Gadung Kasturi Balinese Dance and Music group and the Hei Gu Chinese Percussion Ensemble for an evening of dance and music compositions using traditional forms from Indonesia and China. Although there were many dances in the Balinese and Chinese traditions, my focus was on the two pieces by Wan-Chao, the premiere of “Keep Her Safe, Please! Jakarta 1998″ and “There,” a work from 2008-09. The political unrest is Indonesia and Taiwan inspired Chang’s new work. She has incorporated dance movements from Java, Bali and China to portray the struggle for “a place of belonging.” Choreographers Chang and Kompian Metri Davies also built the costumes that reflected their countries of origin, using long pieces of cloth to carry, wave and drag along the floor. The dancers wove through one another constantly interacting, sometimes reciting or singing a poem by Midiyanto, stating “Do I look for you, or you for me?” “Keep her safe..” is a major accomplishment for Wan-Chao. It is a haunting piece. In her other work on the program, “There,” also a fusion of various Asian dance movements, the five dancers, dressed in white, moved like angelic figures using long swooping curvilinear lines in space. For this viewer, more dynamic variety is called for in the piece. Nonetheless, Chang succeeds as an innovator of fusion forms and as a performer. Her dancing is clear, subtly nuanced and well executed. 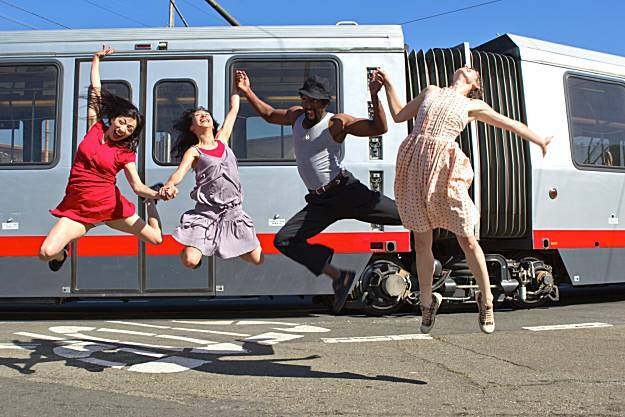 2010 marked the seventh year that Kim Epifano’s Epiphany Productions has gifted San Francisco with “Trolley Dances.” For this reviewer from the East Bay, the opportunity to ride Muni’s Trolleys is a rare opportunity. Although drenched in rain, Oct. 17 “Trolley Dances” on the N-Judah offered some rare treats. Starting at the Harvey Milk Community Center on Duboce and Scott, the brave but damp viewers saw the Shagai Yang-Ge Tibet Dance Group in colorful pink and green outfits. Then, to keep the theme, Joe Goode Performance Group wore fluffy pink wigs for “Too Bad You’re Not Invited,” Goode’s satirical musical theater take on anti-gay propaganda. To Bee Gees and Angelo Badalamenti music, Goode’s dancers vamped as Goode spoke his lines. What a trip! The N-Judah then took the group to Eighth and Irving where, after a short stop at a Dog Store Window to see Phaedra Ana Jones wiggle, went on to Golden Gate Park’s Botanical Gardens. Four fearless dancers performed at Site No. 5, throwing themselves at one another and into the puddles, displaying fabulous physicality. After a short mood change at the the Gazebo to see two traditional dances associated with Odon, a Japanese Festival, the sun emerged long enough for everyone, including the performers, to enjoy Epifano’s finale in the meadow. Unlike many good people of the dance community, I am not a fan of King’s choreography. I was unable, despite gorgeous costuming and stage effects, to find a narrative line in “Scheherazade,” disappointingespecially since this is an ancient myth about the power of telling stories. King’s dancers are phenomenal in gymnastic accomplishments: torsos undulates, couples intertwine, phenomenal lifts are executed, the toe shoe is used as weapon. Except for the long duet, danced on Oct. 17 by Meredith Webster and Corey Scott-Gilbert, the remainder of the work is a series of entrances and exits by solo dancers or duets. Yes, there was a flying catch section for five men and a square of women at the opening, but none of the parts built relationships to the whole or wove a narrative. That of course is King’s choice: but his notes emphasize his study of the texts. Zakir Hussain adapted Rimsky-Korsakov’s familiar music; the handsome set design (more decorative than amplifying) was by Robert Rosenwasser, who is also credited with the costume design along with Colleen Quen. Preceding “Scherherazade,” the Lines company perfomed King’s 2008 “Dust and Light,” 12 interludes to taped music by Poulenc and Corelli using much of the same dance vocabulary uniquely King’s.